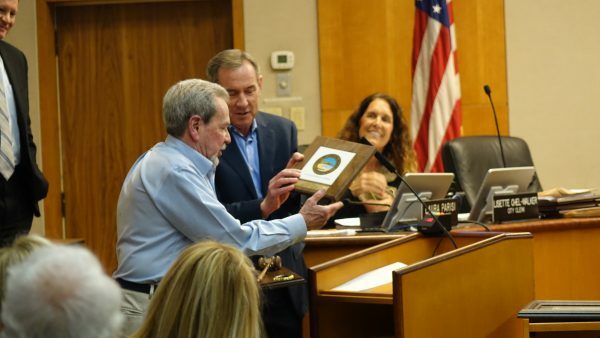 Outgoing Mayor Kelly Boyd is known in Laguna Beach as a man of few words. 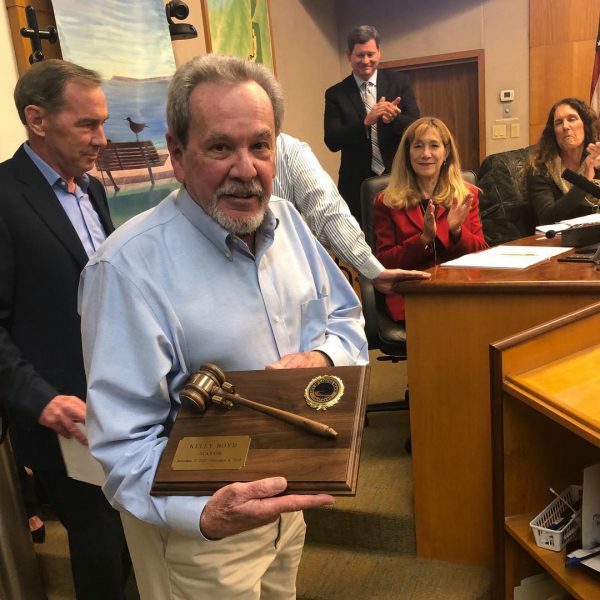 So when it came time for his swan song on Tuesday, Dec. 4, after 16 years of service on the Laguna Beach City Council and three terms as mayor, his fellow cast members at No Square Theater sent him off by singing his own show tune in the Council chambers. Boyd listened silently to a troop of five singers, who earned raucous cheers from a standing-room-only crowd at City Hall. The outgoing mayor is retiring from the panel he first joined in 1978 to continue his fight against cancer. 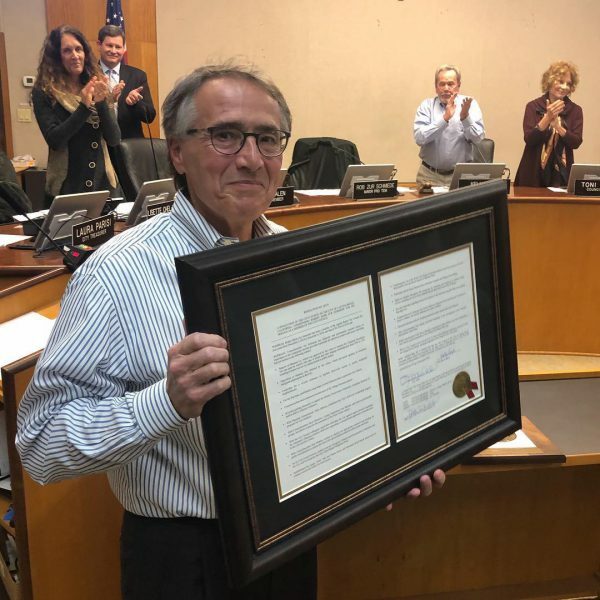 “Whether you realize it or not Kelly, you’re a Laguna Beach icon,” said outgoing Mayor Pro Tem Rob Zur Schmiede, who also stepped down from the dais for the last time Tuesday. Shortly before being elected mayor by the new City Council, Bob Whalen praised Boyd for being honest, straightforward, effective, loyal, and a good friend. Boyd said he’s enjoyed being a Laguna Beach historian who can tell people what things were really like in town years ago. He also praised City Manager John Pietig for hiring the best management team he’s ever seen during his tenure on the City Council. The City Council is also losing member Zur Schmiede, who was elected to the Council in 2014 and brought 13 years of experience on the city’s Planning Commission as well as service on the Design Review Board. Zur Schmiede decided not to run for reelection after his brother was in a traffic collision and needed help with his financial and legal matters. “Although I’m a little sad about the choice, I don’t regret it because I think it was the right thing,” he said. Councilwoman Toni Iseman said it took a long time for her to convince Zur Schmiede to run for City Council and bring his decades of experience in urban planning and economic development for the cities of Fullerton and Long Beach. “If you study us, nobody is as prepared as Rob. Rob can bring everything together…and bring us together,” Iseman said. Even though a majority of Laguna Beach voters didn’t support Measure P, the city still needs to address the important public safety question of how it’s going to prevent future wildfires caused by downed utility lines, Zur Schmiede said. 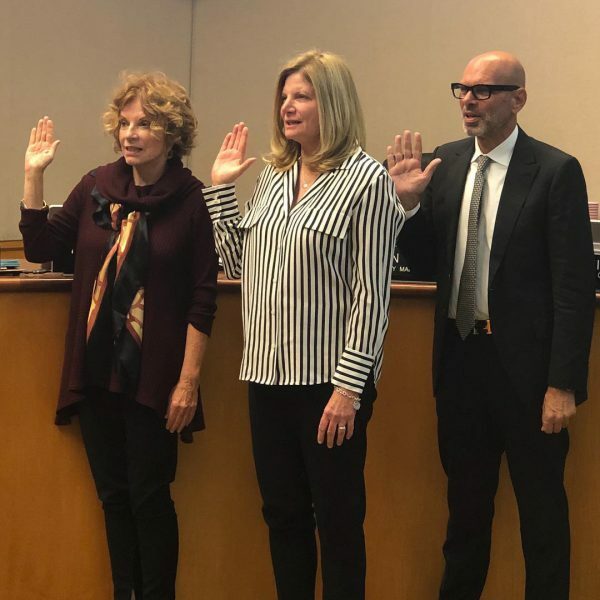 After sending off the outgoing council members, City Clerk Lisette Chel-Walker swore in Iseman, who is entering her sixth consecutive term at the dais, and Council newcomers Sue Kempf and Peter Blake. : New mayor Bob Whalen honors outgoing mayor Kelly Boyd at Tuesday night’s Council meeting. Photo by Daniel Langhorne. Final election numbers show that Blake, an art gallery owner, received the most votes in the Nov. 6 election (14.8 percent), while Iseman received 14.5 percent of the vote, and former Planning Commissioner Kempf received 13.6 percent of the vote. Although the current mayor pro tem is generally first in line to become mayor, Zur Schmiede’s departure moved the City Council to instead vote for Whalen to lead the five-member panel. Councilman Steve Dicterow was named as the new mayor pro tem. Kempf said she was glad the long election season was over and thanked Boyd and Zur Schmiede for their guidance during her time on the Planning Commission. Iseman said the City Council has an incredible task in front of them with so many important decisions to consider and vote on.